Energy / Environment / Statehouse Did Hartwell Really Say That About Climate Change? Is Sen. Bob Hartwell (D-Bennington) truly skeptical that humans are responsible for global climate change? Does he really think the Intergovernmental Panel on Climate Change "has come out with some pretty extreme statements about what's going on?" Did he really suggest that what we call climate change may simply be the result of a naturally warming and cooling earth? That's what we wrote in last week's Fair Game, quoting from a 15-minute interview conducted with Hartwell on April 7. But Hartwell, who chairs the Senate Committee on Natural Resources and Energy, seems to think his words were distorted. 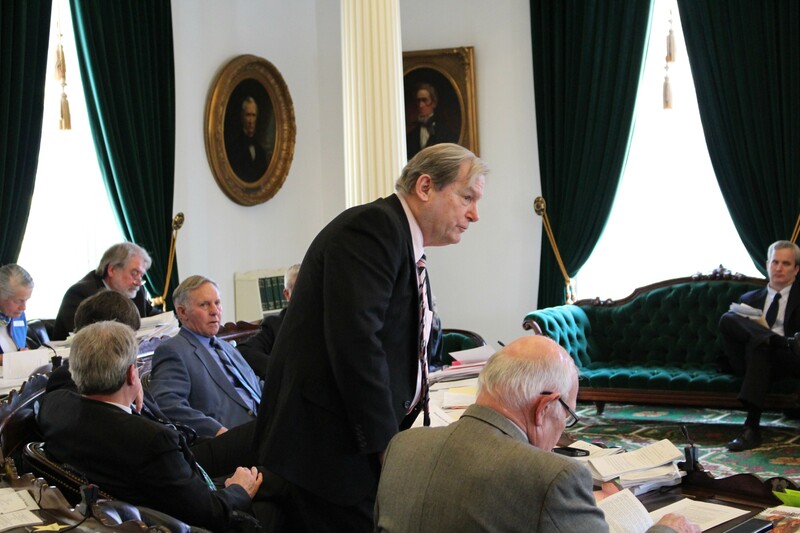 After former lobbyist Bob Stannard linked to the column on his Facebook page and wrote that "Vermonters are very disappointed" with Hartwell's comments, the senator posted a four-paragraph statement clarifying his position and calling into question the column's accuracy. "Unfortunately, some have taken to characterizing my description of the climate change situation without discussion directly with me," Hartwell wrote. "I have and will continue to express my opinion as to what I believe is best for Vermont, even when the press distorts my interviews on occasion, something that often happens to those in public life." He went on to clarify that he believes "there is a change in the climate caused by natural phenomena which has been evolving over a long period of time, a change further exasperated by the influence of human behavior. The science is still in the discovery stage as to which is the greatest contribution to climate change. It can be said that the situation has been accelerated during the past 150 years and safe to say that today's climate would be different without these combined circumstances." Asked at the Statehouse Thursday if there was anything in particular he thought Seven Days got wrong, Hartwell demurred, saying his statement "speaks for itself." But given Hartwell's concerns that his words were distorted, we thought it would be helpful to present the entirety of our discussion about climate change — completely unedited. SEVEN DAYS: I’ve been hearing some real grumbles from the environmental community about your committee. And I’ve been told that you don’t necessarily believe in climate change. Is that true or is that just sort of a —? SEN. BOB HARTWELL: Well, that’s a lot of nonsense. This is coming out of the renewable energy community. It’s not coming from true environmentalists. These people want a different set of standards for land use from everybody else. And unlike some other states, they — That’s really ridiculous. I mean, the climate change thing is real. I have differences with some people as to what’s causing it, but there’s definitely something happening out there. They can grumble all they want. The problem that they have is that they want to be able to get a "certificate of public good" for a renewable energy project and put it anywhere they want — without regard to zoning, without regard to Act 250, without regard to the neighbors, without regard to the towns, without regard to anything. And that is very poor public policy and needs to be changed, and I think the political climate is changing on that. The people really don’t want to be excluded anymore from the process, and they feel they’ve been excluded. So, that’s what the fight — the struggle — has been about. And definitely, there’s no doubt about it that I’ve been hearing this from the renewable energy folks, and that shouldn’t be too big a shock for you. And I understand that, you know, you’ve had some disagreements on some of the wind and solar issues. But I guess I’m wondering, can you tell me, you said you do have some differences with people about what’s causing it? I mean, what is your sense of what’s causing climate change? I think what I don’t like about the extremists on the climate issue — and there are some very extreme people out there (Not all of them, but some of them are here in Vermont. A lot of them, most of them, are elsewhere.) — is that somehow this is all being caused by human behavior. There is a significant natural phenomenon that is also going on, in my view. They think if you don’t blame it all on anthropomorphic sources, that somehow you don’t understand it. And they’re just wrong about that. There is a very significant natural shift going on here, and man’s behavior just simply, probably, exacerbates it. That’s all I’m saying. To suggest that mankind is causing the whole climate to shift, that’s a big reach. I don’t think anybody’s ever proved that. I think, man doesn’t help it much with a lot of pollution, that’s for sure. And there’s been tremendous progress on that front. But there’s a natural phenomenon going on as well, so all we’re doing is accelerating that. But I take exception to people who suggest that Vermont is somehow going to change the climate. That’s pretty, kinda, presumptuous to suggest that a state of 600,000 people is going to somehow shift the climate. I don’t believe that. But I certainly believe that, in the aggregate, all around the world, there is something going on — that it’s changed things considerably and we oughta figure out constructive ways to deal with it, and I just don’t agree with all the ways we’re dealing with it. But I also think that the renewable energy people suggest that they’re making a huge contribution to reducing the pace of climate change. I don’t think that’s true at all. I think the biggest part of the emissions now is coming from transportation and home heating, and I’ve worked strenuously to get these houses weatherized and to stop using all of this foreign oil and all the emissions that are coming out of houses because they’re so poorly weatherized. It’s a far bigger bang for the buck then, you know, industrial wind. So we just have some differences. But there are issues out there that, you know, we agree on and some things we don’t. Forgive my ignorance, because this is just not an issue that I’ve focused on very much, and I’m not a scientist at all, and I won’t pretend to be. I don’t play one on TV. But if it’s not man-made sources, what is it? I mean, what is causing it? I don’t know. But if you go back through the history of time, you have ice ages and you have warming spells, and you have ice ages, and you have significant cooling spells. I don’t know what causes it, historically, but there have been huge climate shifts before mankind came along and started creating air pollution. Which was clearly created. There are shifts historically over thousands of years that scientists are very well apprised of. So, this is a shift that’s been going on for some time and generally making some areas of the world warmer, but not all, and creating some weather disturbances that people aren’t used to in some places, and creating, you know, drier weather in some places and wetter weather in other places. It’s a very complex issue, and just to suggest that it’s all being done by mankind — mankind’s a contributor, but there’s more to it than that. Do you have a sense of how much mankind plays a role in it? I have no idea. That is a very interesting question, and it would be very interesting to figure that out, but I’m positive that the people that are making a big issue of this don’t know either. Is the science, or what you read in the papers, do you find that to be not true? Like the stuff that the [Intergovernmental Panel on Climate Change], which just released that big report on climate change, do you disagree with their conclusions? It’s hard. It’s hard. And I’m not sure. You know, there’s so much of it out there now. Now there’s a lot of dispute to make it worse. There’s a lot of science that says it isn’t happening the way the climate change — the really aggressive commentators — say it is. There’s other very credible people who say it isn’t true. So now I’m beginning to — I don’t know what to think, to tell you the truth. But I don’t think that just because — it’s ideology for some people. That’s what’s happened. And if you’re not with them on their claims, you know, then you’re somehow old-fashioned or not with it. And that’s simply not true. I have some concerns about the U.N. commission on climate change. They’ve come out with some pretty extreme statements about what’s going on, and I don’t know whether they’re true or not, but I’m going to reserve judgment. Just because some renewable energy people think that they’re the source of solving the problem in Vermont — that just isn’t true. I mean, they may be helping out in some way, but if you look at energy, it’s pretty interesting to find out that, you know, for example, industrial wind is not in the reliability system. ISO New England, which is the entity that governs all of the transmission of power throughout New England — I was down there visiting them in Massachusetts two weeks ago — they do not rely on wind. The reason they don’t is because it doesn’t operate all the time. That doesn’t mean you shouldn’t do it. It just means you have to put it in perspective, whereas the power plants — the traditional power plants — operate whenever they’re told to. So it’s not a simple set of issues. I can give you an example: Renewables supply one percent of the generation power in New England. Natural gas supplies 45 percent. And without natural gas, you wouldn’t be able to shift off of coal-fired plants, which is what we’re trying to do. We’re gonna be almost coal-free in New England in the next three to four years. There’s only about four major facilities left, and without the natural gas, it’s not likely you could take those plants off-stream as soon as possible, because the coal is obviously the dirtiest fuel. They’re not playing the big huge role that everybody — that they claim. All you’d have to do is visit ISO New England to understand it. So that doesn’t mean we shouldn’t do it. I just think it should be in perspective. I’m anti- the way it’s been handled in Vermont. I do not like massive projects being done without any regard for anybody’s true wishes, except the developers. If they can just get a "certificate of public good" from the Public Service Board, they don’t have to pay any attention to zoning. They really don’t have to pay any attention to what’s going on on abutting properties, and that’s not really fair. It’s not fair to take everybody out and act as if this stuff is inevitably, desperately, needed now, so that you ignore the neighbors, you ignore the towns, you don’t have to deal with Act 250. You know, with Act 250, we used to — you had to get a permit for anything above 2500 feet. If you built an outhouse, you would’ve had to have gotten a permit, and now they build huge massive wind projects on the ridgeline, so there’s an inherent hypocrisy here that is very troubling to some people around here. It’s very troubling to at least three of us, if not four of us, on this committee. And the response to just accuse us of being anti-renewable is not going to get them where they want to go.